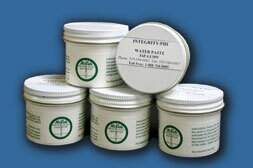 Water Paste (12/case) - When water is present, water level indicating paste shows exactly how much, enabling you to pump out the precise amount from the tank. The absence of colour change by the water paste is your dependable guarnatee that no water is present. Gasoline Paste (12/case) - Use of gasoline level indicator ensures a highly accurate reading when gauging gasoline storage tanks. Simply spread a thin coating on a tape or gauge rod where liquid is likely to appear before lowering it into a tank. A sharp line of demarcation at the product interface is instantly shown.